A blog or a website will have articles and posts regarding a particular topic. The comments are necessary for the posts or content on the website. The comments that people post below your article or content of the webpage, will either ask them to login to any one of their accounts like Google, Facebook, Disqus, Twitter, Linkedin etc. 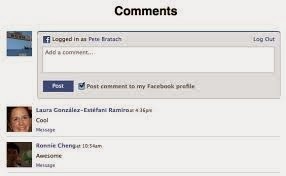 If people should leave comments using their Facebook profile directly on your site, then you have to use a Facebook social plugin called "Comments box". There are many social plugins in Facebook that you can make use of for your website or blog. One of them is "Comments Box". Now in Facebook tab, open "Plugins"
Set the "Number of Posts". By default it is 5. Change it if you want to. Select the "Color Scheme" either "Light" or "Dark"
As you set the details, the preview of the comments box is shown below. If the box settings are ready then copy the code to embed in your website. Now click "Get Code" button. Now open the back end of your blog or website where you actually type the articles and posts before publishing. Enter the code. And you can see that below every article or blog post, the comments are made available for the Facebook users to use their profile and comment on.